Depending on the time of year, Jacob Johnson is either making a tackle, passing for an assist or snagging a fly ball on a sprint. In an age of specialization where kids often focus on one sport, Johnson is a three-sport starter, playing football, basketball and baseball at Capital High School. A couple of days after he takes the helmet off and plays in his last football game, he’ll be running up and down the basketball court. Then a couple of days after his last basketball game, he’ll be swinging at the plate, turning out for baseball. Capital High School’s Jacob Johnson is a three-sport All-American student athlete. And he’s not a benchwarmer, cheering his team to victory. He’s an all-league selection in both football and baseball. He’s a starter at guard in basketball. This year Jacob’s football season will be extended a week in January. He’s been selected to play in the ninth annual Offense-Defense High School All-American Bowl in Orlando, Florida, on Jan. 4. It’s a prestigious game. Some of the game’s biggest names have played in it, including Dez Bryant, DeAndre West and Cam Newton. And the all-star game that matches the east against the west won’t be his last football game. Jacob is being recruited by several colleges, including Eastern Washington, which nearly upset the University of Washington Huskies earlier this season. He’s also talked with coaches from the University of Montana and Montana Tech. The UW has also talked with him and has invited him to watch some home games this season. 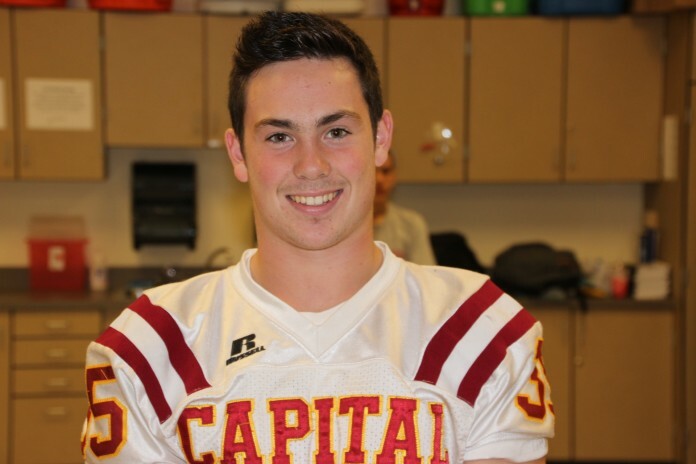 His future in college football will be as a safety, where he’s started at Capital since his sophomore year. Jacob Johnson tackles Olympia’s Ben Bishop during the 2014 Spaghetti Bowl. Whether he’s on pass coverage (he had three interceptions after five games), or he’s flying up to stop the run (he had a season-high 15 tackles against Lincoln), Jacob has proven he’s got the knack for picking a pass or tackling a tailback. He’s double trouble for opposing quarterbacks. 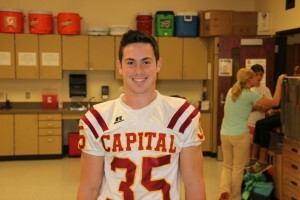 It didn’t take Jacob long to earn a spot on Capital’s varsity. As a freshman, he played on special teams and showed his tenacity for racing down field on punt coverage. At 5’11”, 185 pounds, Jacob isn’t the biggest player on the team. But he just might have the biggest heart. He comes to play. That tenacity, that drive to win, isn’t something that just turns on under the Friday night lights. It’s the approach Jacob takes in everything he does. In the classroom, he’s a 3.2 student. On the baseball field, he batted over .400 last season, earning second-team all-league as a center fielder. 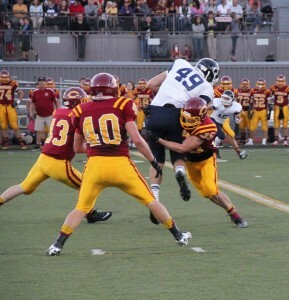 Last year as a junior, he was first team all-league as a safety. As a sophomore, he was second-team all-league in football. Those that know him say that playing in an All-American game is appropriate. Capital’s Jacob Johnson unleashes a defensive hit during a 2012 game when he was a sophomore. That’s definitely true on the football field. On offense, he plays slot or the “Z position” in Capital’s Wing T offense and free safety or strong safety on defense. So he’s in the game a lot. After returning punts as a sophomore and junior, Jacob is now on the sideline, resting, during special teams. With 4.7 speed, Jacob has good speed, but he’s not the fastest player on the field. However, his coach said he is quick – quick reacting, quick with the reads on a play, quick to make a decision on coverage. Players selected to play in the all-star game is based on a top 100 list, a national recruit ranking determined by Rivals.com and published by Sports Illustrated. The game will be televised by ESPN.